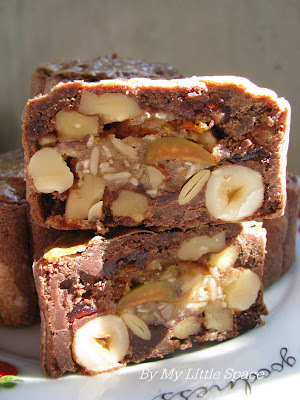 Yeap, my first attempt on this mixed nuts mooncake recipe! It's my mom special order....errr... it's actually last year order but I don't have the time to put my hands on this. So, here it is! Well, my mom always complaining that the store bought mixed nuts mooncake is way too sweet for her. She wanted something light and not so sweet. So, I decided to give her another surprise by making her this chocolate flavour mooncake which is completely different from what she used to eat. Hopefully, she will love it! - combine all ingredients in a big bowl and mix well. - then stir in 4 tbsp corn/olive oil and mix till well combined. - divide into 40gm ball each for mini size mooncake. - simmer chocolate and oil over a double boiler untill melted. 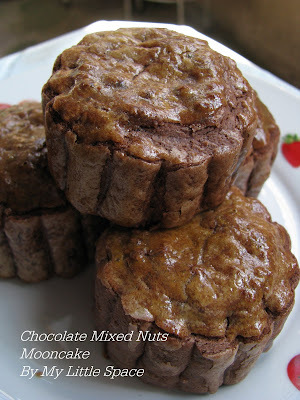 - stir chocolate mixture into flour and mix to form a thick paste. - leave the thick paste to rest for an hour. - then divide pastry dough into 35gm each (for mini size) . - start wrapping the mixed nuts filling with the dough and slightly coat the dough with flour. - bake at 200'c for 5 mins and then remove mooncake from oven. - slightly brush with egg glaze and continue baking at 180'c for another 10 mins or untill golden brown. * It's best to serve this one day after. This skin texture is unlike the traditional kinda of syrup dough skin. It isn't sweet at all. In fact, it tastes much like cookies with nuts and it's totally packed with seeds flavour. I'm glad I tried the new skin recipe on this. I think it is incredible! Hopefully, my mom will like the new look of her mooncakes. haha... Just send a package home this morning. Keep my fingers cross! I am just going to stick to normal ones first... just hope to succeed! Penny dear, wishing you all the best! Looking forward to your mooncake post. Hopefully soon! Good luck! Love its nutty filling! When is the moon festival? Kristy, what a co-incidence! I posted mine today too! Also nutty mooncakes. Yours look nice too, enjoy all the chewing! Amazing, Kristy! All those goodies filling your mooncake. I loved the photos of one cut in half so we could see exactly how you made them. Yummy! Another beautiful snack in a package. I loves these recipes! And so healthy and tasty, too. Whoa! I never really liked the bean fillings...I wish I knew about mooncakes like this. Looks dee-licious. hi kristy, i got yr message earlier on, will do so as soon as i can. thanks! I love the picture that shows the all the delicious nuts inside, yum! I love your pictures!! and your cakes look great, Im sure your mom is gonna love them. Cheah : Yeah, I saw them! They look so pretty. Just left in the message. Thanks! Barbara : Oh thank you so much! Glad that you like it too. Lyndz : I am very much looking forward to your homemade mooncakes too. Can't wait to see them! hehe... All the best, dear friend. smallkucing : Pei sei-leh! hehe.... Thanks alot! that's very sweet of you. Otehlia : Glad that you like it too! This looks very much like granola bars, right? Jay : Thanks alot! It's a great pleasure for having you here. Lena : You're welcome! Just take your time. No worries! Natasha : Thank you! Yeah, I like it too. Thank you very much all for spending your time here with me today. Hope you're having a fabulous day. Enjoy! Your mooncakes look delicious!!! LOVE all the nuts. I'm sure your mom will love them! Wow, look at all those gorgeous nuts in there. I can imagine this would be a hearty treat. You are so creative! Mooncake is popular in Japan too, but I didn't know the homemade version! Looks so beautiful and delish!! 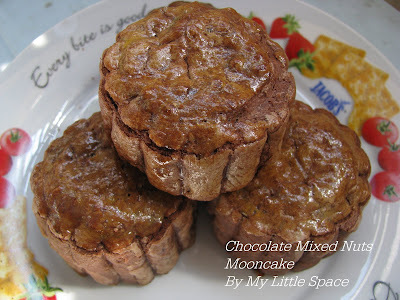 what a nutty mooncake,i love this recipe,kristy,very innovative! This is the first time I've seen a moon cake that is as beautiful on the inside as it is on the outside. It looks positively heavenly! Wowza! These look amazing. I mean really... No calories, no fat, right? Wow.. this looks really healthy AND yummy! Thanks for sharing this recipe!! Neyeeloh : Hi there, welcome to my humble little space and nice to meet you. Hope to hear from you more often. Elra : You can make something out without using the mould. Penny also ordered some mooncake moulds from the site. Maybe you can try that out too! Mary : Thank you very much. I hope my mom will like it. Bridgett : Thanks alot. That's very kind of you. Spoon : Thank you. Hopefully, you can show me more about the Japanese mooncakes too. Looking forward to the post. Alison : Thank you, dear. Hope you will enjoy the recipe as well! Keri : Oh wow, thanks alot and glad that you like it to! Kumi : You're welcome! Hope you will enjoy the recipe as well. Thanks everyone for spending your weekend here with me. Hope you're all having a fabulous day. Kristy, no worry your mum will sure love it. I am sure my fil will like to have some but too bad he need to keep away from mooncakes since he is having grout. Your moon cake creations are wonderful! Who don't want to have a bite of such delicious nutty moon! I wish I could share a piece now! Jess : So sorry about your FIL! I think a slice or two doesn't cause much trouble! Should let him have an least a little treat. Come on, it's mooncake festival! Just let him enjoy. My FIL has diabetic but we still let him enjoy whatever he likes. Just control the amount consume will do! Sutapa : Thank you so much! You're such a sweetheart. Thanks ladies for stopping by and hope you are all having a wonderful day. I will order a dozen of those please! nuts and chocolate? you're killing me! Kristy, you are such a talent! Everything you make looks like a work of art. Where do you come up with these ideas? I'm always blown away.